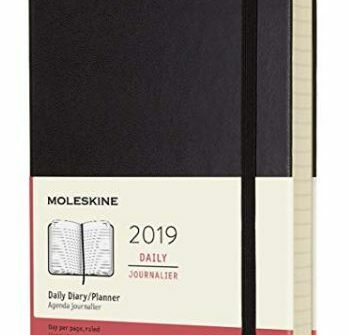 This is Moleskine Daily Planner for 2019 It’s a large size (5” x 8.25”) in Black. The pages are thick enough to handle nearly all inks and it really holds up to daily use. Moleskine daily planners are perfect for business planning, travel planning, bullet journals, and fitness journals. Each day gets its own page, so you can track complicated projects and stay on top of your busy schedule. 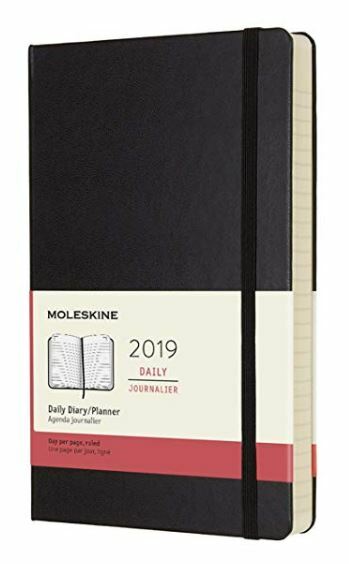 INCREASE & TRACK PRODUCTIVITY: Moleskine daily planners come with calendar grids & pages for to do lists, bullet journaling or other scheduling & project tracking styles. Moleskine daily planners make it easy to reach your goals.